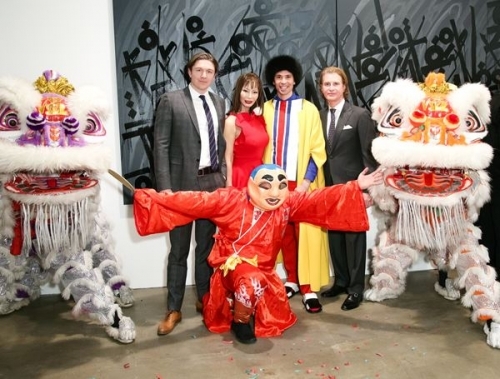 What: Celebrating the opening of Chelsea newcomer, Hoerle-Guggenheim Gallery, and an upcoming RETNA exhibition, in a Chinese New Year-themed extravaganza. Where: The evening preamble included a reception and surprise dragon dance at the Hoerle-Guggenheim Gallery followed by a charming dinner at the Red Cat. Who: The crowd was filled with art world heavyweights including Hirshhorn director Melissa Chiu, designer Vivienne Tam, Andy Warhol Museum director Eric Shiner, artnet News editor Benjamin Genocchio, designer Austin Scarlett, artnet's Jacob Pabst and Sophie Neuendorf, Kevin Doyle of Sotheby's, Francine LeFrak, Polina Proshkina, Lisa Chanos, Yana Balan, Emily Newhouse, Lavinia Branca Snyder, Susan Shin, and hat-designer Eric Javits. Why: Having just launched the new space, Hoerle-Guggenheim felt it appropriate to celebrate its inception with a colorful Chinese circus. The Moment: Dragon dancers storm the gallery halls to the awe of guests and a flurry of flashes from smartphone cameras. Exhibition: RETNA's upcoming exhibition at Hoerle-Guggenheim opens this Thursday, February 12 and runs through March 12.